Wherever you are make sure you can listen to the music you love, at the volume you want to. No power, no worries. Charge up your At Large Audio speaker suitcase before you leave home and enjoy 10 hours of your favourite music at full volume, or 20+ hours at a more reasonable volume. 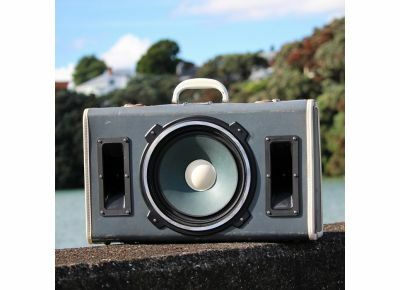 Hand crafted in New Zealand by two musicians, each and every unit is completely unique and bespoke. The team behind At Large Audio are Sam Bennett and C.P. Moore. Sam - a drummer and guitarist and C.P. - a pianist and keyboardist, have been in bands together since 2004. Sam and C.P. have always loved music and the outdoors. They believe that today when everything is portable, music lovers should be able to listen to their favorite songs at the volume they like wherever their travels may take them. They should be able to throw an impromptu party while camping in the middle of nowhere or amp up the atmosphere at a pub when the stereo is not keeping up (this may have actually happened). 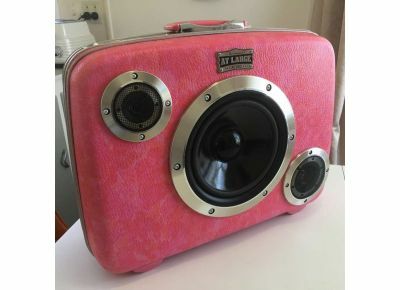 If you sing from the same songsheet, then you will love At Large Audio's hand made speaker suitcases. Speaker Suitcases will be dispatched in 1 working day. Cresta, Biggie Smalls and Coral are all small units.